With penetration of broadband Internet these days we end up downloading lot of audio and video files, so sometimes we would have an requirement of joining or merging audio or video files. 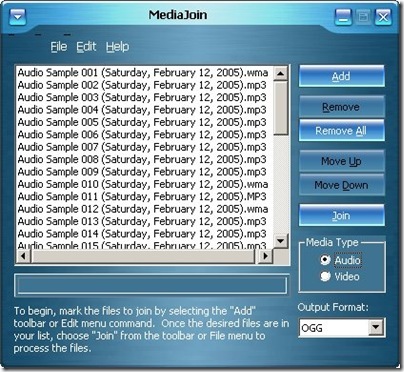 MediaJoin is a free utility that can join or merge various popular audio and video files that are available. The popular audio and video files that are supported by MediaJoin are MP3, WMA, WAV, OGG, AVI, MPEG-1, MPEG-2, and WMV. There settings are available for bitrate, frequency, channels, VBR, and WMA profile for audio files; and AVI audio and video codec, MPEG bitrate, frame rate, size, and WMV profile for video files, providing complete output control. With MediaJoin, you get a MP3 joiner, WMA joiner, WAV joiner, OGG joiner, AVI joiner, MPG joiner, and WMV joiner hence we can MediaJoin has complete audio-video solution from media joining perspective.